Daonella frami, from Schatz (2004). 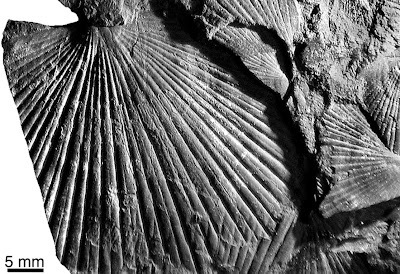 The Halobiidae were a family of bivalves that first made their appearance in the lower Middle Triassic (mid-Anisian, for those who are, unlike yours truly, conversant with such things). They were a specifically Triassic event, taking their bow towards the end of the period, and during that time they managed to fit in four roughly successive genera (with some overlap), Enteropleura, Daonella, Aparimella and Halobia, with Daonella and Halobia particularly speciose. Each of these genera is believed to have been ancestral to the next, except that Halobia may have arisen from Aparimella, from Daonella, or possibly polyphyletically from both (Chen & Stiller 2010). Within the larger genera Daonella and Halobia, the rate of species turnover was very high. This, together with their wide distribution at the time, has led to halobiids being the focus of numerous biostratigraphic studies, the Triassic being a time period somewhat poor in really good stratigraphic markers. Unfortunately, distinguishing the recognised species of halobiid is no easy task; for instance, it is estimated that there are roughly ten times as many available species names in Halobia than there are actual valid species (McRoberts 2010). Halobiids have been commonly referred to as 'flat clams', and they were certainly that. Even the thickest Daonella were never more than 0.2 times as thick as they were tall* (Schatz 2005). Their shells were also very thin compared to other bivalves. The genera are distinguished by the main ornamentation and also by the morphology of the posterior auricle, a tubular fold towards the dorsal margin of the shell. Daonella has prominent radial ornamentation and lacks an auricle (except for the early and probably basalmost species Daonella fengshanensis which possessing a small auricle retained from the ancestral Enteropleura: Chen & Stiller 2010). The auricle reappeared with Aparimella and Halobia, the latter of which had a double auricle (McRoberts 2000). *For those unfamiliar with bivalve orientation, the two shells are treated as left and right, with the umbo (the pointy bit where the shells join) at the top. Reconstruction of live Daonella, from Schatz (2005). Daonella fossils have generally been found in black shales, commonly believed to indicate anoxic environments and hence not their original habitat when alive (Schatz 2005). The most popular suggestion for the original mode of life of Daonella has been that they were pseudoplanktonic, living attached to floating wood or larger nektic animals such as ammonites. However, Schatz (2005) pointed out that such a mode of life would not have been possible for Daonella as they appeared to lack any means of attaching themselves to a substrate; unlike attached bivalves such as mussels, they lack an opening in the shell where a byssus could have been extruded (for those familiar with opening mussels, that would be the soft part near the hinge where you can slide in a knife). Nor is the roughly circular shape of a halobiid suitable for a life embedded in the substrate. Instead, Schatz suggested that Daonella lived lying on the top of the soft mud that eventually became the shales. The original belief that this environment was completely anoxic was incorrect, though it would have still been very low in oxygen, an environment in which many bivalves can be found living today. The round, flat shape of Daonella would have allowed it to 'float' on the mud, while the high surface area-volume ratio would have decreased its oxygen demands relative to supply. Chen, J.-H., & F. Stiller. 2010. An early Daonella from the Middle Anisian of Guangxi, southwestern China, and its phylogenetical significance. Swiss Journal of Geosciences 103 (3): 532-533. McRoberts, C. A. 2000. A primitive Halobia (Bivalvia: Halobioidea) from the Triassic of northeast British Columbia. Journal of Paleontology 74 (4): 599-603. McRoberts, C. A. 2010. Biochronology of Triassic bivalves. In: Lucas, S. G. (ed.) The Triassic Timescale. Geological Society, London, Special Publications 334: 201-219. Schatz, W. 2004. Revision of the genus Daonella (Arzelella) (Halobiidae; Middle Triassic). Journal of Paleontology 78 (2): 300-316. Schatz, W. 2005. Palaeoecology of the Triassic black shale bivalve Daonella—new insights into an old controversy. Palaeogeography, Palaeoclimatology, Palaeoecology 216 (3-4): 189-201.